Buzzient’s embedded integration delivers social inside Siebel so you can enhance customer satisfaction with social customer service. There’s no need to use separate, outboard social apps. Or separate social apps that are merely external messaging interfaces to Siebel. Why require your CRM users to degrade their efficiency, effectiveness and user experience by switching between different apps and screens when they can have it all within “single screen” Siebel? With Buzzient you’ll have all the capabilities, efficiencies and user effectiveness you need right there inside your familiar Siebel app. * Oracle’s own Social Relationship Management (SRM) products don’t even provide embedded integration. And Oracle SRM doesn’t support legacy Siebel versions. Buzzient is the only way to reap the benefits and ROI of true, embedded social integration inside current and legacy Siebel. 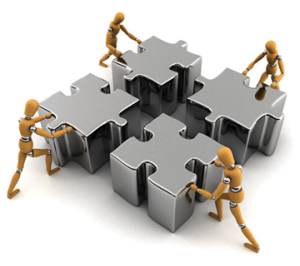 Why is embedded social in “single screen” Siebel so important? A key to the power of Siebel CRM over the years has been in bringing a wide range of integrations to the fingertips of the Siebel user. These integrations deliver the operational and actionable data the user needs to best support your customers by tying into your CRM system of record.A key to the value of those integrations and data is the efficiency and effectiveness they bring to the user through their delivery within the “single screen” of Siebel. Through transparent, embedded integrations, one app gives the user more power than many separate ones. Billing data, product configuration information, proposal generation, master customer records, RMA details, asset management data, entitlements, emails and more could be coming from other systems. Yet it’s all presented within the users’ “single screen” Siebel interface so they in turn can provide your customers with the best service. There is no launching of many different separate screens, no alt-tab’ing, no physical switching between apps. Users stay within their a single Siebel app screen that’s truly integrating with other sources of valuable data and critical information about your customers. The result is the most effective and efficient user experience for both your Siebel users, and as a result, your customers. Requiring Siebel users to use separate, outboard social apps is counter to the proven integration model. Plus you’d incur additional overhead of training on those separate apps. Don’t forget that means you also aren’t linking the social systems of engagement (and engagement history) with your CRM system of record. And as with other data/information sources, wouldn’t that make your Siebel users less productive and therefore negatively impact customer service levels? Not to mention your investments in other valuable Siebel integrations are virtually tossed aside by requiring a separate second screen for social. Regardless of whether these separate, outboard social apps are messaging content into Siebel, they are not truly integrated unless they are embedded. True integration means external data, information and action that maximize customer service effectiveness are available to the user from within their single Siebel screen. 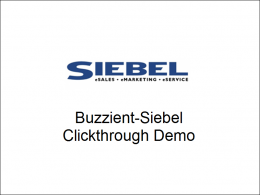 When it comes to social, that’s what Buzzient Social CRM for Siebel delivers to you. Don’t worry if you haven’t upgraded to the newest versions of Siebel. Our integration goes all the way back to v7.8. And no problem if you do have the latest or anywhere in between. We support all the way up through v8.x+ and Open UI. Extend the life and value of your existing Siebel asset by adding social to your business processes. Support for versions back to 7.8 mean you don’t have to discard or upgrade Siebel in order to add the increasingly critical social channel. Auto create Service Requests from social media posts based on keyword matches or sentiment with Buzzient’s powerful filtering engine. Boost customer satisfaction by being able to handle social posts in your Siebel service workflow. Buzzient gives you more than just embedded social listening and enagagement. You also have all our other features available from within Siebel. These include filters, alerts, analytics, reports and outbound publishing. 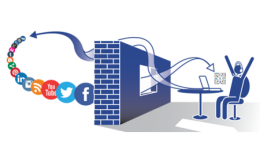 Respond to customers directly on social from inside Siebel. 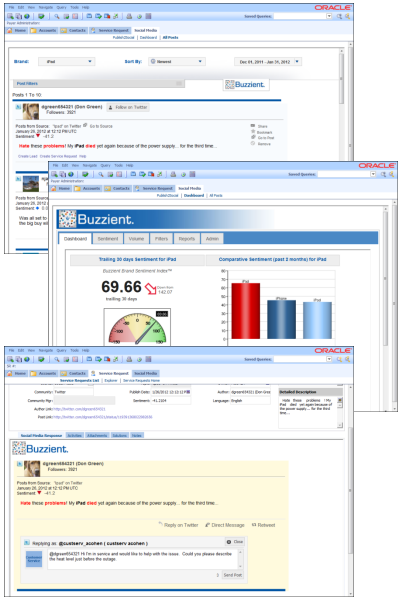 Buzzient adds an engagement widget into your Siebel service requests and leads. No need to exit to separate social apps to respond. Inbound / outbound engagements are also tracked as activities for your history trail. Be sure to visit the Demos and Videos page for even more.